Pomegranate with its edible, delicious and ruby red pearls are packed with powerful nutrients and potent antioxidants to safeguard our health. 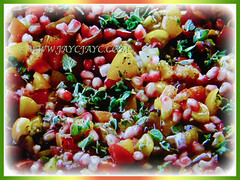 Its sweet juice has a unique flavour and is considered among the healthiest foods on planet earth. 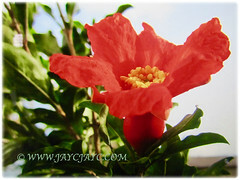 Botanical Name: Punica granatum (syn. 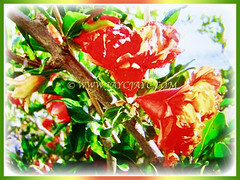 : Punica florida, Punica grandiflora, Punica spinosa). Common Names: Pomegranate, Buah Delima in Malay. Etymology: The genus name Punica is derived from the Latin word punicum malum, the Carthaginian apple, in turn derived from Poenus, Carthaginians, Phoinikes, Phoenicians. The species epithet granatum means many seeded. 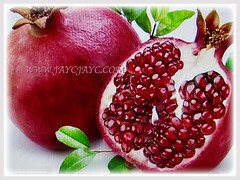 Pomegranate comes from the Latin word pomium meaning apple. Origin: Native from Iran to the Himalayas in northern India. It is also cultivated elsewhere around the globe. 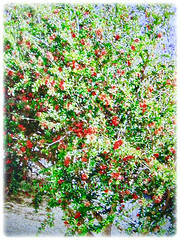 Features: Punica granatum is from the genus Punica that consists of 2 species of fruit-bearing trees. 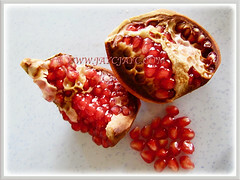 However, there are numerous cultivars of Pomegranate. 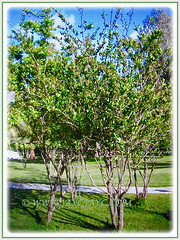 A shrub or small tree growing between 6-10 m tall but typically between 3.6-5 m in height. Mature specimens can develop sculptural twisted-bark multiple trunks. Pomegranates are long-lived. The trunk is covered by a red-brown bark which later becomes grey. The branches are stiff, angular and often spiny. Its evergreen, glossy and leathery leaves are opposite or in whorls, narrow and oblong-lanceolate, measuring 3-7 cm long and 2 cm broad. The trumpet-shaped flowers may be solitary or grouped in clusters of two or three at the branch ends. It is self-pollinated or cross-pollinated by insects. Eventually, the flowers will develop into orange-sized edible fruits, measuring 5-12 cm in diameter that ripen to yellow and tinged with red. 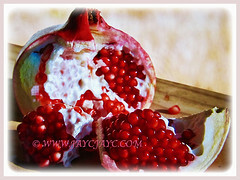 The interior is separated by membranous walls and white, spongy, bitter tissue into compartments packed with sacs filled with sweetly acid, juicy pink, red or whitish arils. In each sac there is one angular, soft or hard seed. The seeds are embedded in a white and spongy, astringent membrane. The tough and leathery rind is usually yellow and overlaid with deep red or purple. The number of seeds in a pomegranate can vary from 200 to about 1400. 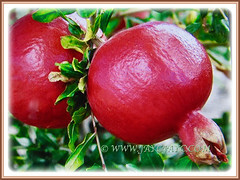 Culture (Care): Punica granatum or Pomegranate can be grown easily with a little extra care. Light: Best in full sun for optimum growth and fruit production. Nonetheless, it will grow and flower in partial shade. Moisture: Dry to moderate water requirements. Water regularly and thoroughly. It is somewhat drought-tolerant once established. Soil: Calcareous or acidic loamy and well-drained soils. However, it has adapted to a wide range of soil types. Others: Prune if needed. Remove root suckers as they develop and control unwanted weed growth with root mulch. Feed once monthly with 2-4 ounces of ammonium sulphate or other nitrogen fertiliser. Generally free from serious pests and diseases. Nevertheless, watch out for insect pests of the pomegranate that include the pomegranate butterfly Virachola isocrates, the leaf-footed bug Leptoglossus zonatus, fruit flies, leaf spots and fruit blotch. Punica granatum or Pomegranate can be tolerant of moderate frost down to about -12 °C. It is usually deciduous, but in certain warmer regions the leaves will persist on the tree. In fall, the leaves turn yellow in non-tropical areas. Where winter hardy, grow in beds and borders whereas where not winter hardy, grow in containers which are overwintered indoors in bright and cool locations with reduced watering. With good growing conditions, trumpet-shaped and orange-red flowers bloom throughout the summer. The tree will fruit best in areas with long, hot and dry summers of 32°C and cooler winters. The tree can be severely injured by temperatures below -11°C. The tree adapts well to container culture and will sometimes fruit in a greenhouse. Take containers outdoors into bright, mostly sunny locations in summer with regular application of moisture. Punica granatum var. nana is a dwarf and compact variety with scarlet flowers and edible fruits. It grows to only 1 m tall and is most suited to be grown indoors. Propagation: Easily propagated from seeds, hardwood cuttings and air layering. Usage: Punica granatum or Pomegranate’s attractive foliage, flowers and fruits will make it an excellent landscaping plant. 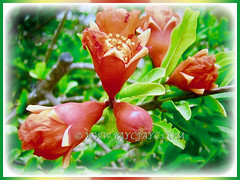 Its captivating flowers and ruby red fruits is suited as an ornamental plant in gardens and parks. It can be crafted into a bonsai specimen tree and brought indoors as a houseplant to beautify your home.